We're now in week two of Nardwuar the Human Serviette's rollout of SXSW interviews. Last week, he shared talks with Rae Sremmurd, Migos, ILOVEMAKONNEN and Wale, and now he's shared a chat with mega-producer Mike WiLL Made-It. The pair engage in an entertaining 13-minute conversation. As usual, Nardwuar's got some gifts for his subject, including a hockey-themed 7-inch and plenty of other records, but it's not just prop work. They also talk about some excellent subjects, including Gucci Mane's advice on how to eat big burgers properly. 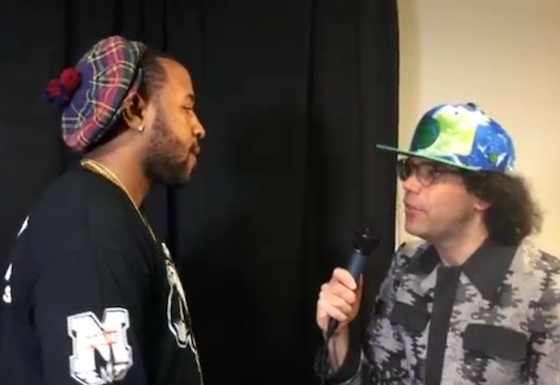 Watch Nardwuar talk shop with Mike WiLL Made-It below.